Spring Into Action - Canvas - Framed - framed by Leigh Lambert // £696.00. 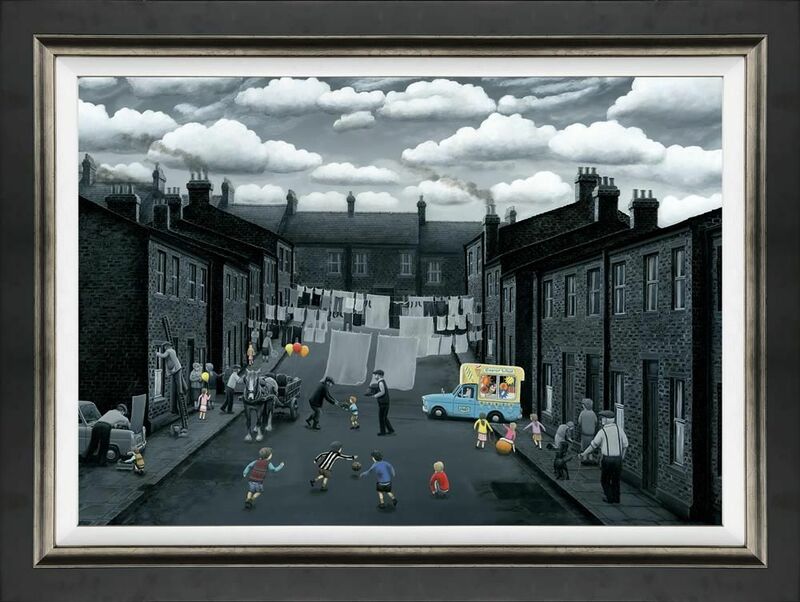 The theme of football and the working class community coming together to play this most English of games, is often visited by established artists like Leigh Lambert, as well his contemporaries, such as: Mackenzie Thorpe, Paul Horton & Bob Barker. There is something about the simplicity, comradery and universal appeal of the beautiful game and the fact that you only need a ball (of any size) and a couple of jumpers for goal posts and you can play. It strengthens communities, builds bonds amongst the children and adults and gives us a sense of passion and purpose; perhaps these young boys have aspirational goals to be as successful and famous as their heroes who they see at the big match or on TV every week?